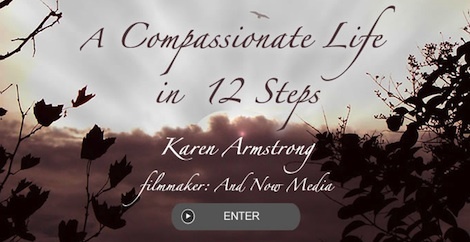 This morning Vook is introducing its next new offering, "A Compassionate Life in 12 Steps," from Karen Armstrong, a prominent religious scholar, TED Prize winner and founder of the Charter for Compassion. With the Armstrong release Vook continues its pioneering work melding text-focused books with original video (hence the name "vook") into new multimedia experiences. I've been fascinated by Vook's concept since I first heard about it and last week I had a chance to talk to Vook's founder Brad Inman to learn more. Vook has created over 50 vooks to date, sometimes sourcing books via its partnerships with traditional publishers like Simon & Shuster, HarperStudio and others, and sometimes working with public domain material (e.g. Shakespeare). Brad explained that a typical vook will retain 30-80% of the original book's text and incorporate around 20 original videos. Sometimes, as with a golf instructional book, Vook turned it into 8 vooks, which can be bought fro $5 a piece or as a bundle for $40. The overall budget for the videos is around $2,000-$5,000, with Vook tapping into TurnHere (Brad also founded the online video production company). Brad explained that TurnHere already had a lot of expertise with author profile videos. The price for vooks ranges from $1.99 to $16.99, with the sweet spot around $4.99-$6.99. Brad said that Vook targets to recoup its costs within 4-6 weeks of a vook's launch, which is extremely fast by book publishing standards. Vooks are accessible on the web or via apps for the iPad, iPhone and iPod Touch. An Android app will be available in the next 30-45 days. Brad is pretty candid about Vook still being in the early days of experimenting with this format, learning as it goes about what works and what doesn't. No doubt it's going to take some time to refine the product itself and also raise consumer awareness. What's exciting to me is that Vook is operating at the intersection of online video, consumer devices (iPad, smartphones, etc.) and traditional book publishing. The rapid technology innovations in video and devices means Vook has ever-stronger tools to enhance its experience (Brad cited the iPad's page-turning effect as just one example). Many people have lamented the downward spiral that book publishing has been in recently, with interest in reading books on the wane. E-book readers like the Kindle have helped spark a small resurgence, but while they enhance portability, they don't innovate the overall book experience the way that Vook does. Given how conditioned people are to going on YouTube and other sources to watch video, it feels natural to augment books with specific, related video. For example, how often have you been reading a book and hungered to hear the author, in their own words, describe their inspiration, writing style, creative sources, etc? In fact, as Brad says, Vook's secret sauce is perfecting how video should be integrated in an elegant/useful way with the text. Creating any new media format is of course a tall task. But in a way, I liken what Vook is doing to what magazines are doing with their iPad apps - making them more visually engaging and interactive. As these catch on, Vook's value proposition will become more familiar. Books have been around for a long, long time, but in their traditional format they are beginning to look dated. By adding meaningful new value for readers, authors and publishers while keeping its expenses low, Vook may well be on a path to success.